On the occasion of bringing out the first issue of the 41st volume of Journal of Medical Physics (JMP), after completion of 10 years of its online publication with Medknow Publications (presently Wolters Kluwer Medknow Publications), it gives the Editors an immense pleasure in thanking our colleagues in the Editorial teams (including the editorial board and the publishers) and all the referees for sharing the responsibility of publishing the journal, and most importantly in thanking all the authors for having chosen this journal for publication of their research work, especially for having taken the comments and suggestions of the referees sportively in the right spirits. With the unabated cooperation of the office bearers, representatives, and members of the Association of Medical Physics of India (AMPI), the planned four issues of the online and the print versions of the journal have been published uninterrupted and on time in each quarter of the year, each year, for the past 10 years since 2006. Incidentally, the publication (one volume with four issues per year) which was started in 1976 in the form of AMPI Medical Physics Bulletin  (until 1993), also completes 40 years of its existence along with the formation of the association (AMPI), a registered body with the charity commission in Mumbai. Hence, it is also time to express our gratitude to our preceders and the founders of AMPI and its quarterly publication. The journal has steadily grown in strength by strength by gaining a noticeable attention worldwide. 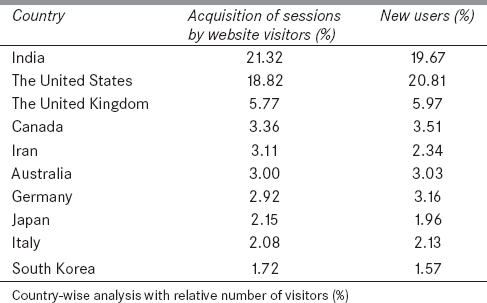 [Table 1] presents a list of top ten website-visitor countries, and the percentage of the number of website-visitors of the journal from different countries, indicating the growing popularity of JMP. It is evident that the journal has become equally popular in the developed countries (especially in the USA) apart from the host country (India). Surprisingly, the journal had a large number of JMP-website visitors and submissions of manuscripts for publication from Iran. As the journal has an open website and a double-blinded refereeing process (identities of the authors and the referees are not disclosed to one another), there is no restriction on submission of manuscripts from any quarter of the world and no biasing in the evaluation and the acceptance of the manuscripts. This double-blinded refereeing process appears to be the unique feature and the main strength of JMP. The scope of the journal remains fairly wide to the interest of wider community of researchers and professionals in the field of medical radiation physics. The scope covers the use of radiation to health sciences; especially to promote research and development related to radiation therapy, diagnostic radiology, nuclear medicine, and radiation protection, and the related quality assurance, standardization, calibration procedures, etc. Efforts are on to initiate the inclusion of manuscripts of debates on contemporary topics by presenting arguments for and against the use of a technique, source, machine, protocol, methodology, etc. Medical physicists are encouraged to come forward with the proposals of such debates. At present, this is in vogue in the form of Letters to Editor related to the published papers. On the SCImago journal rank (SJR), JMP has attained SJR value of 0.33 and a value of cites per doc. (2y) of about 0.9, which seems to be a respectable status. The SJR indicator is known to measure the scientific influence of the average article in a journal. Cites per doc appear to measure the scientific impact of an average article published in the journal by using the same formula, which is used for computing impact factor (IF) by Thomson Reuters. Recently (December 8, 2015), the journal has been accepted at emerging sources citation index (ESCI), a new platform from Thomson Reuters. This is expected to take the journal to a new level as it provides a great opportunity of getting associated with the prestigious platform from Thomson Reuters where a Thomson Reuters logo will appear on the journal website in due course of time. This means that the JMP will now be searchable at web of science, giving it a wider global visibility along with citation data and other journal metrics. The editors will also now get real-time insight into a journal&#39;s citation performance. The journals with this new platform, ESCI, have been identified as important to key opinion leaders and evaluators worldwide. Unlike science citation index expanded (SCIe), journals accepted at ESCI do not receive an IF. However, ESCI is considered to be a first level toward getting the journal indexed in SCIe for an IF for which every journal appears striving for. This is because IF has become a measure of quality of a journal. Institutions and professionals generally value a publication by the IF of the journal, in spite of the fact that there have been varying views on the validity of an IF. For obtaining an IF of SCIe, the main parameters and criteria to be met are known to be the international diversity among the authors and the editorial board members, and the citation of the published papers in other publications in different journals. By keeping the desired balance of the affiliations of the members of the editorial board and the size of the editorial board and by providing full opportunity to authors in bringing out newer research, emphasis has been to improve the standard and citation of the published manuscripts irrespective of an IF. For this, a hesitation-free scientific exchange between the authors and the peer reviewers via editor is encouraged by using the double-blinded refereeing process. However, we hope that with the foreseen support and wider acceptance, Thomson Reuters will have to allocate a respectable IF by the end of the year 2017. Pradhan AS. JMP enters a new era. J Med Phys 2006;31:4. Shanta A, Pradhan AS, Sharma SD. Impact factor of a scientific journal: Is it a measure of quality of research? J Med Phys 2013;38:155-7.